Welcome, in the new year! I hope you all had a beautiful holiday season and are starting the new year with fresh energy. Hibiscus flowers are native to warm-temperate, subtropical and tropical regions throughout the world. Here in my home we grow them indoors and cherish them for their showy flowers. Hibiscus is a primary ingredient in many herbal teas, popular as a natural diuretic, containing vitamin C and minerals. Dried hibiscus is edible, and is often a delicacy in some parts of the world. It can also be candied and used as a garnish. 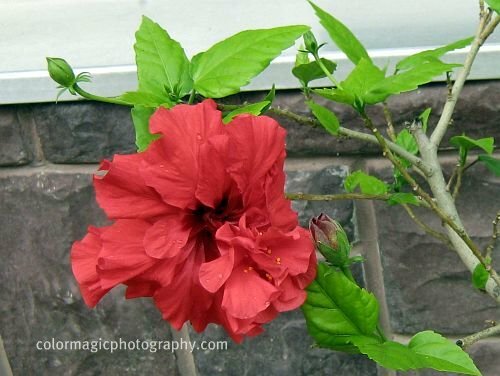 The red hibiscus flower is traditionally worn by Tahitian women. A single flower is tucked behind the ear indicating the wearer's availability for marriage. Isn't that a beautiful tradition? Join Macro Flowers Saturday and show us some fabulous pictures. I love your hibiscus. Especially the orange one. So warm adn rich in its color. And nicely photographed. I can't ever seem to get enough images of that favorite flower: hibiscus. J'dore. I love the fact that the hibiscus flowers lives for only a day or two. The yellow one is a beauty. Oh I never knew they can be grown indoors! Hibiscus is still the Gumamela of my childhood which I use for my blow bubbles! The texture on those petals are just like paper and so beautiful. Love the info with the photos as well. Nice job. There's lots of hibiscus here, they are easy to grow. 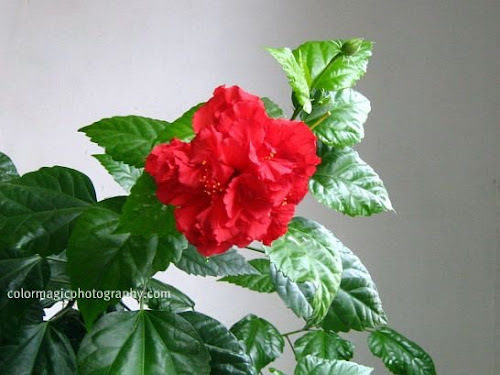 Hibiscus is the national flower of Malaysia, a neighboring country. Gorgeous hibiscus, what a wonderful way to start the new year. I love the color and texture of your first shot. Thanks for the info, I especially love the Tahitian ladies' tradition. Those colors are very vibrant as well. Beautiful hibiscus, and I love those colors! Bright and cheerful hibiscus! So pleasant to see on this dreary grey day! Lovely hibiscus. Yes, I know I accidentally entered the wrong url... I emailed you about it. Thanks so much for fixing it! Have a great day. Fabulous shots of the flower. I am new here, and so glad that I had picked up enough courage to join this meme. I am overwhelmed by the photography skills I see here. 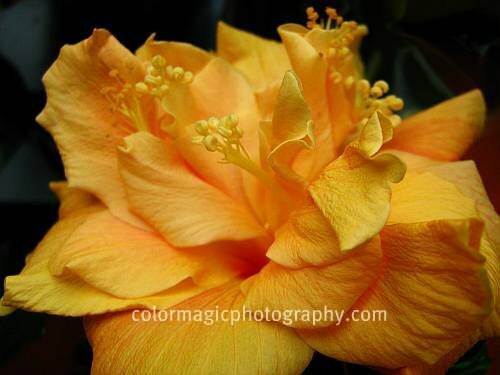 Your picture of the yellow hibiscus is fantastic! Welcome Rosie @ My garden in heaven, you are too kind, I'm just an amateur but you are right, all contributions are amazing, including yours. In case someone enters the wrong link and realizes too late, please post a second time with the note "correct link", or something alike. We are on different timezones and I might be sleeping, so don't wait for me to correct it because you might lose some comments. I'll delete the wrong link when I see it. Your Hibiskus is fantastics, I never seen such yellow duble. I have a red duble and I love hibiskus. Beautiful pictures.